Lyricist Jerome Leiber (April 25, 1933 – August 22, 2011) and composer Michael Stoller (born March 13, 1933) were American songwriting and record producing partners. They found success as the writers of such crossover hit songs as "Hound Dog" (1952) and "Kansas City" (1952). Later in the 1950s, particularly through their work with The Coasters, they created a string of ground-breaking hits—including "Young Blood" (1957), "Searchin'" (1957), and "Yakety Yak" (1958)—that used the humorous vernacular of teenagers sung in a style that was openly theatrical rather than personal. They were the first to surround black music with elaborate production values, enhancing its emotional power with the Drifters in "There Goes My Baby" (1958), which influenced Phil Spector, who studied their productions while playing guitar on their sessions. Leiber and Stoller wrote hits for Elvis Presley, including "Love Me" (1956), "Jailhouse Rock" (1957), "Loving You", "Don't", and "King Creole". They also collaborated with other writers on such songs as "On Broadway", written with Barry Mann and Cynthia Weil; "Stand By Me", written with Ben E. King; "Young Blood", written with Doc Pomus; and "Spanish Harlem", co-written by Leiber and Phil Spector. They were sometimes credited under the pseudonym Elmo Glick. In 1964, they launched Red Bird Records with George Goldner and, focusing on the "girl group" sound, released some of the greatest classics of the Brill Building period. In all, Leiber and Stoller wrote or co-wrote over 70 chart hits. They were inducted into the Songwriters Hall of Fame in 1985 and the Rock and Roll Hall of Fame in 1987. Both born to Jewish families, Leiber came from Baltimore, Maryland, and Stoller from Long Island, New York, but they met in Los Angeles, California in 1950, where Stoller was a freshman at Los Angeles City College while Leiber was a senior at Fairfax High. Stoller had graduated from Belmont High School. After school, Stoller played piano and Leiber worked in Norty's, a record store on Fairfax Avenue, and when they met, they found they shared a love of blues and rhythm and blues. In 1950, Jimmy Witherspoon recorded and performed their first commercial song, "Real Ugly Woman". Stoller's name at birth was Michael Stoller, but he later changed it legally to "Mike". Their first hit composition was "Hard Times", recorded by Charles Brown, which was a rhythm and blues hit in 1952. "Kansas City", first recorded in 1952 (as "K. C. Loving") by rhythm & blues singer Little Willie Littlefield, became a No. 1 pop hit in 1959 for Wilbert Harrison. In 1952, the partners wrote "Hound Dog" for blues singer Big Mama Thornton,  which became a hit for her in 1953. The 1956 Elvis Presley rock version, which was a takeoff of the adaptation that Presley picked up from Freddie Bell's lounge act in Las Vegas, was an even bigger hit. Presley's showstopping mock-burlesque version of "Hound Dog", playfully bumping and grinding on the Milton Berle Show, created such public excitement that on The Steve Allen Show they slowed down his act, with an amused Presley in a tuxedo and blue suede shoes singing his hit to a basset hound. Allen pronounced Presley "a good sport", and the Leiber-Stoller song would be forever linked to Presley. Leiber and Stoller's later songs often had lyrics more appropriate for pop music, and their combination of rhythm and blues with pop lyrics revolutionized pop, rock and roll, and punk rock. They formed Spark Records in 1953 with their mentor, Lester Sill. Their songs from this period include "Smokey Joe's Cafe" and "Riot in Cell Block #9", both recorded by The Robins. The label was later bought by Atlantic Records, which hired Leiber and Stoller in an innovative deal that allowed them to produce for other labels. This, in effect, made them the first independent record producers. At Atlantic, they revitalized the careers of The Drifters and wrote a number of hits for The Coasters, a spin-off of the Robins. Their songs from this period include "Charlie Brown", "Searchin'", "Yakety Yak", "Stand By Me" (written with Ben E. King), and "On Broadway" (written with Barry Mann and Cynthia Weil). For the Coasters alone, they wrote twenty-four songs that appeared in the US charts. In 1955, Leiber and Stoller produced a recording of their song "Black Denim Trousers and Motorcycle Boots" with a white vocal group, the Cheers. Soon after, the song was recorded by Édith Piaf in a French translation titled, "L'Homme à la Moto". The European royalties from another Cheers record, "Bazoom (I Need Your Lovin')", funded a 1956 trip to Europe for Stoller and his first wife, Meryl, on which they met Piaf. Their return to New York was aboard the ill-fated SS Andrea Doria, which was rammed and sunk by the Swedish liner MS Stockholm. The Stollers had to finish the journey to New York aboard another ship, the Cape Ann. After their rescue, Leiber greeted Stoller at the dock with the news that "Hound Dog" had become a hit for Elvis Presley. Stoller's reply was, "Elvis who?" They would go on to write more hits for Presley, including the title songs for three of his movies—Loving You, Jailhouse Rock, and King Creole—as well as the rock and roll Christmas song, "Santa Claus Is Back in Town", for Presley's first Christmas album. In the beginning of the 1960s, they started Daisy Records and recorded Bob Moore and The Temps (w/Roy Buchanan) on their label. In the early 1960s, Phil Spector served an apprenticeship of sorts with Leiber and Stoller in New York City, developing his record producer's craft while observing and playing guitar on their sessions, including the guitar solo on The Drifters' "On Broadway". After leaving the employ of Atlantic Records—where they produced, and often wrote, many classic recordings by The Drifters with Ben E. King—Leiber and Stoller produced a series of records for United Artists Records, including hits by Jay and the Americans ("She Cried"), The Exciters ("Tell Him"), and The Clovers ("Love Potion #9", also written by Leiber and Stoller). In the 1960s, Leiber and Stoller founded and briefly owned Red Bird Records, which issued The Shangri-Las' "Leader of the Pack" and The Dixie Cups' "Chapel of Love". After selling Red Bird, they continued working as independent producers and songwriters. Their best known song from this period is "Is That All There Is?" recorded by Peggy Lee in 1969; it earned her a Best Female Pop Vocal Performance Grammy. Earlier in the decade, they had had a hit with Lee with "I'm a Woman" (1962). Their last major hit production was "Stuck in the Middle With You" by Stealers Wheel, taken from the band's 1972 eponymous debut album, which the duo produced. In 1975, they recorded Mirrors, an album of art songs with Peggy Lee. A remixed and expanded version of the album was released in 2005 as Peggy Lee Sings Leiber and Stoller. In the late 1970s, A&M Records recruited Leiber and Stoller to write and produce an album for Elkie Brooks; Two Days Away (1977) proved a success in the UK and most of Europe. Their composition "Pearl's a Singer" (written with Ralph Dino & John Sembello) became a hit for Brooks, and remains her signature tune. In 1978, mezzo-soprano Joan Morris and her pianist-composer husband William Bolcom recorded an album, Other Songs by Leiber and Stoller, featuring a number of the songwriters' more unusual (and satiric) works, including "Let's Bring Back World War I", written specifically for (and dedicated to) Bolcom and Morris; and "Humphrey Bogart", a tongue-in-cheek song about obsession with the actor. In 1979, Leiber and Stoller produced another album for Brooks: Live and Learn. In 1982, Steely Dan member Donald Fagen recorded their song "Ruby Baby" on his album The Nightfly. That same year, former Doobie Brothers member Michael McDonald released "I Keep Forgettin' (Every Time You're Near)", adapted from Leiber and Stoller's "I Keep Forgettin'". 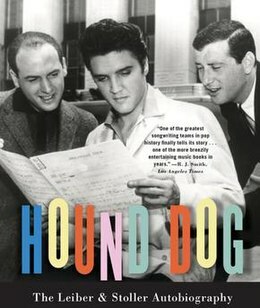 In 2009, Simon & Schuster published Hound Dog: The Leiber and Stoller Autobiography, written by Leiber and Stoller with David Ritz. As of 2007, their songs are managed by Sony/ATV Music Publishing. With collaborator Artie Butler, Stoller wrote the music to the musical The People in the Picture, with book and lyrics by Iris Rainer Dart. Stoller and Butler's music received a 2011 Drama Desk Award nomination. On August 22, 2011, Leiber died in Cedars Sinai Medical Center in Los Angeles, aged 78, from cardio-pulmonary failure. He was survived by his sons Jed, Oliver, and Jake. Stoller wrote both music and lyrics to the song "Charlotte", recorded by Steve Tyrell and released in advance of the 2012 Democratic National Convention in Charlotte, NC. Leiber and Stoller won Grammy awards for "Is That All There Is?" in 1969, and for the cast album of Smokey Joe's Cafe, a 1995 Broadway musical revue based on their work. Smokey Joe's Cafe was also nominated for seven Tony awards, and became the longest-running musical revue in Broadway history. In the 1950s the rhythm and blues of the black entertainment world, up to then restricted to black clubs, was increasing its audience-share in areas previously reserved for traditional pop music, and the phenomenon now known as "crossover" became apparent. Leiber and Stoller affected the course of modern popular music in 1957, when they wrote and produced the crossover double-sided hit by The Coasters, "Young Blood"/"Searchin'". They released "Yakety Yak", which was a mainstream hit, as was the follow-up, "Charlie Brown". This was followed by "Along Came Jones", "Poison Ivy", "Shoppin' for Clothes", and "Little Egypt (Ying-Yang)". They produced and co-wrote "There Goes My Baby", a hit for The Drifters in 1959, which introduced the use of strings for saxophone-like riffs, tympani for the Brazilian baion rhythm they incorporated, and lavish production values into the established black R&B sound, laying the groundwork for the soul music that would follow. ^ "JERRY LEIBER". Rockabilly.nl. Retrieved 13 October 2018. ^ Gillett, Charlie (1996). The Sound of the City: The Rise of Rock and Roll (2nd ed.). New York, N.Y.: Da Capo Press. pp. 72–75, 192–194. ISBN 0-306-80683-5. ^ a b "Johnny Mercer Award - Songwriters Hall of Fame". Archived from the original on 2006-10-01. Retrieved 2006-12-05. ^ Decurtis, Anthony; George-Warren, Holly, eds. (1976). The Rolling Stone Illustrated History of Rock & Roll (3rd ed.). New York: Random House. pp. 148–51. ISBN 0-679-73728-6. ^ "Jerry Leiber and Mike Stoller - inductees". Rock & Roll Hall of Fame. Retrieved 2006-12-05. ^ Leiber and Mike Stoller with David Ritz, Jerry (2009). Hound Dog: The Leiber & Stoller Autobiography. Simon & Schuster. p. 28. ISBN 978-1-4165-5938-2. ^ "History of Jewish songwriters told in 'Beautiful' - Crescent City Jewish News". Crescentcityjewishnews.com. 1 August 2014. Retrieved 13 October 2018. ^ "Big Mama Thornton: The Life and Music. McFarland Inc". Mcfarlandbooks.com. ISBN 978-0-7864-7759-3. Retrieved 29 September 2014. ^ a b Tobler, John (1992). NME Rock 'N' Roll Years (1st ed.). London: Reed International Books Ltd. p. 30. CN 5585. ^ Gilliland, John (1969). "Show 7 - The All American Boy: Enter Elvis and the rock-a-billies. [Part 1]" (audio). Pop Chronicles. University of North Texas Libraries. ^ a b c Tobler, John (1992). NME Rock 'N' Roll Years (1st ed.). London: Reed International Books Ltd. p. 19. CN 5585. ^ Tobler, John (1992). NME Rock 'N' Roll Years (1st ed.). London: Reed International Books Ltd. p. 55. CN 5585. ^ a b Tobler, John (1992). NME Rock 'N' Roll Years (1st ed.). London: Reed International Books Ltd. p. 40. CN 5585. ^ Peggy Lee Sings Leiber and Stoller. peggylee.com. 2005. ^ "Hound Dog: The Leiber & Stoller Autobiography". Google Books. Retrieved 24 November 2015. ^ "Sony/ATV Music Publishing Acquires Leiber Stoller Catalogue". Sony.com. Sony Corporation of America. Retrieved 24 November 2015. ^ Jonze, Tim, "Songwriter Jerry Leiber dies at 78", Guardian.co.uk, 23 August 2011 12.27 BST. Retrieved 2011-08-23. ^ "Jerry Leiber at the Songwriters at the Songwriters Hall of Fame". Songwritershalloffame.org. Retrieved 29 September 2014. ^ "Mike Stoller at the Songwriters at the Songwriters Hall of Fame". Songwritershalloffame.org. Retrieved 29 September 2014. ^ Archerd, Army (17 April 1998). "Harlin next to use 'Titanic' tank". Variety.com. Retrieved 11 April 2018. ^ Gillett, Charlie (1996). The Sound of the City: The Rise of Rock and Roll ((2nd Ed.) ed.). New York, N.Y.: Da Capo Press. pp. 72–75. ISBN 0-306-80683-5. ^ Tobler, John (1992). NME Rock 'N' Roll Years (1st ed.). London: Reed International Books Ltd. p. 72. CN 5585.